A couple of years before Neil Armstrong became the first man to walk on the moon, a Florida Chevrolet dealer paid its patriotic dues by giving Corvettes to him and other astronauts. Armstrong apparently returned his'67 Corvette a year later and it was sold to a NASA employee. After suffering the kind of neglect (and unwanted attention) so many cars do over the decades, Armstrong's 'Vette is in rough shape, but it's for sale on eBay, where bidding has already exceeded $120,000. 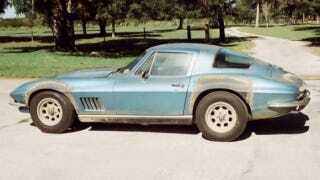 According to the seller, Armstrong received the Corvette from Jim Rathman Chevrolet in Melbourne, Fla. in Dec. 1966. Rathman gave astronauts a chance to drive new Corvettes for a year, then turn them in to get the latest model. This '67 supposedly has the 390 hp 427 V8 and 4-speed transmission — about what you'd expect for an astronaut who would be bored driving anything else. If you believe the seller, the car has been sitting since 1981. Supporting this claim are a 1981 Georgia registration sticker, a set of poorly installed, yellowed fender flares, and a coat of grime and dust that would suggest that the car has been sitting outside in the South since before Metallica was even a real thing. Other than paperwork proving the dilapidated Corvette belonged to Armstrong, the seller also promises a pile of NOS parts which can be used to right decades of owner applied wrongs to this museum worthy classic. That's one small step for a famous guy's beater, one giant leap for whoever buys it.